When it comes to eating cookies, I have my classic favorites. I love homemade chocolate chip cookies, oatmeal raisin cookies and even just plain sugar cookies. I even venture out a little bit and enjoy the Heath bar brickle cookies for a little bit of an extra flavor. When it comes to cookies in the house Michelle and Sean are the real experts and lovers of all things cookie and Michelle is always on he lookout for a new cookie to try or make. Sometimes you want a recipe that you can put together really easily and have done fast, as was the case last week when Michelle was looking to bring some cookies into her office one day. 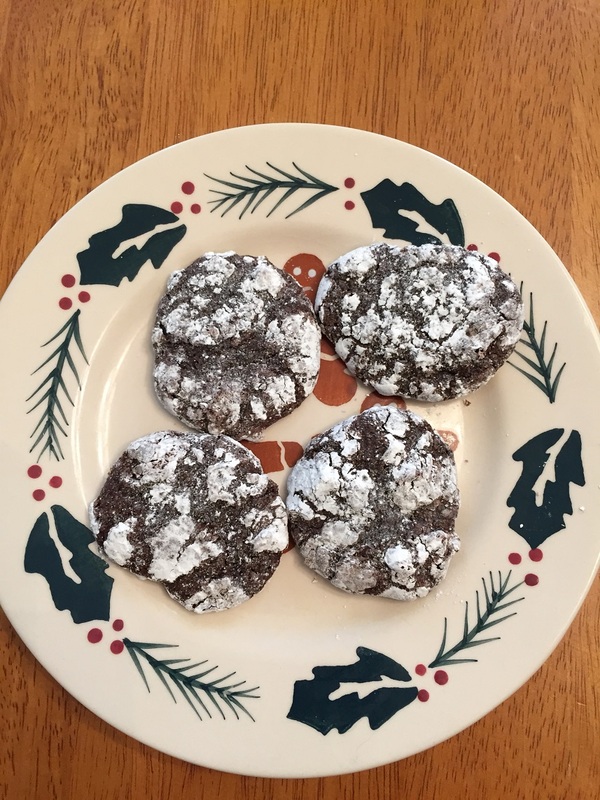 She had used the chocolate crinkle cookie recipe in the past and really loved it and I had never seen her make it before until I was amazed at what was in it and how quickly it all came together. I had seen her make these from Martha Stewart’s recipe at Christmas time, but never like this.This recipe comes from the Best Ever Cookie Collection and uses only 4 ingredients to get it all together. Heat the oven to 350 degrees. Grease a cookie sheet with nonstick spray or use parchment paper or a silicon baking mat on the cookie sheet. In a large bowl, mix the dry brownie mix, water and egg together with a spoon. Mix for about 50 strokes or until the ingredients are well blended. Place the powdered sugar in a separate shallow bowl or dish. Shape the dough by rounded teaspoonfuls into balls or use a small cookie scoop to make the dough balls. Roll the balls in the sugar until they are well coated. Place the cookie balls on the prepared cookie sheet about 2 inches apart. Bake the cookies for 10 to 12 minutes or until almost no indentation remains in the center of the cookie when it is touched lightly. Remove the cookie sheet from the oven and allow the cookies to cool on the cookie sheet for 1 to 2 minutes before removing the cookies to a wire rack to cool completely. The recipe yields about 3 dozen cookies, give or take and if you ever wanted a nice brownie in cookie form this is it. It has that great chocolate flavor you get from a brownie in just a little cookie form and the powdered sugar is the perfect touch. I could see making these even just a little bit larger and putting some ice cream between them to make some awesome ice cream cookie sandwiches. I am not a milk drinker myself but Sean swears you have to have them with a cold glass of milk to finish them off. Michelle left a few at home for us and brought the rest with her to the office where they were quickly devoured and gone. This recipe gives you a great alternative way to use that box of brownie mix you have sitting in the closet if you don’t feel like having brownies and want a cookie instead. That’s all I have for today (it’s Monday – busy work day!). Check back next time for another recipe. until then, enjoy the rest of your day and enjoy your meal!